We had been preparing for this adventure for a long time. Planning, purchasing, packing, and in our minds - plotting how we thought it would go. Some of us built whole family vacations around the Vogalonga, others were there for only a few days. - it's part of a gondolier's job to be so. Nevertheless, we had been training for this adventure - getting together for group rows, and deliberately putting in more hours on the back of a gondola. When we arrived in Venice, we went out on the lagoon in club boats as often as we could. Of course it wasn't something we were forced to do - HECK NO! We love rowing Venetian boats - especially in the Veneto, but all the same, we went at it with vigor. So when the big day arrived, we were ready for the adventure (whatever that adventure might be). The weather has been mentioned in previous posts, and for good reason. Short of a war breaking out in the region, there really isn't anything that can put a damper on the Vogalonga…except horrible weather. Unlike other sporting events, it seems that there's no definitive way to compare this Vogalonga with the 34 others, and I don't want to exaggerate, but I will commit to saying that at times it was awful. The wind was wicked; it churned up the sea. Everyone on my boat spent the whole day in long sleeves and long pants. Sunlight cheated through periodically, other times the skies were dark and the clouds unfriendly. My daughter Cassandra was a passenger in our boat and she describes the clouds as "dark and evil", comparing them to something you might see only in a movie. The only thing that didn't happen was rain, but with the conditions as they were, most folks probably would have just laughed hysterically if we'd received a downpour - it certainly would have been fitting. Early on the morning of the 31st, things at the GSVVM were excited and lively - typical atmosphere of a big event there. The sun was shining and many expected the rest of the day to be the same. Club members were scurrying about, getting their boats ready, hammering in their forcola wedges, tossing their gear in, and lining up to hit the bathroom one last time. Tim had left earlier than everyone else - he was rowing solo and wanted to beat the crowds. Megan Sliger and I were on a four-person sandolo with club member Alessandra Puppo, and GSVVM President Bepi Penzo. My wife and our other daughter Isabella were lucky enough to sit as passengers in the bow of the Mestrina - the GSVVM's pride and joy - a fourteen-person "quattordesona". Other California rowers had come out separately, and I've heard that they ended up rowing with another club, but I don't know for sure. As we rolled our sandolo over to the hoist, we found ourselves in sea of people and boats - boats of all types, and people from all over Europe - all waiting for one of the hoists and jockeying for position. Bepi Penzo (a man who personifies the phrase "larger than life") barked a few commands, grabbed the sandolo by the tail, and started dragging it through the crowd. When you're with the president of the club, your boat is in the water without delay. After the sandolo was in the water and we were all situated, we set out towards Venice, only to be greeted by unrelenting crosswinds and rolling swells. 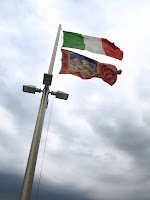 The Gruppo Sportivo Voga Veneta - Mestre is on the mainland, just a stone's throw from the long bridge that joins Venice with the rest of the world. This means that getting to the Bacino di San Marco (where Vogalonga starts), requires an extra four miles of rowing. The journey from the GSVVM to Cannaregio is not usually a great undertaking - I've done it many times, both solo and in a group. Heading across the lagoon that morning, our boat was tossed about, and some of the crew were literally knocked off their feet numerous times. We kept rowing, taking water to the face, and struggling to keep the boat going in the right direction. It didn't take long to realize that the only way to get from point A to point B in such a wind was to "fly diagonal" like a small airplane against a crosswind. Other boats were getting knocked around too. Some boaters realized they'd "brought the wrong kind of boat for the conditions" and packed it in. People quickly lost their struggles, and a number of boats turned back before even getting to the other end of the long bridge. 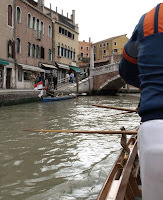 Bepi and I took turns rowing a poppa, and after a long and unexpected fight, we reached Venice - entering at the Cannaregio Canal. 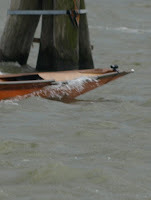 We encountered many rowing club boats that had clearly been prepared for the Vogalonga, but were not in the race. Uniformed rowers were standing around on the fondamenta - not looking like they were in any hurry to get to the starting line and join the row. Conditions in the canal city were much more tolerable, and as we passed under the Tre Archi bridge it seemed like the wind was leaving us. An overcast sky painted every bridge and building a dull gray. Heading up the Grand Canal was nothing short of surreal: the place was empty, and for the first time, Venice seemed like a ghost town. Hi Greg and all the gondola enthusiasts out there. I applaud you Greg for including your wife and children in that awesome experience of rowing the Vogalonga. Ive had a similar experience with my son back in 2002. I think that today is noteworthy of the fact that Giorgia Boscolo ,the daughter of Dante became the first oficial female gondolier in Venice.She is 23 years old and has mentored by her dad for years. The source of the news came through Reuters and was a story on page 3 of the Boston Globe today Saturday June 27.
congrats to all the lady rowers out there especially to my good freind Megan Sliger in Boston. Many thanks for the news headup! Yet we should not forget about Alexandra Hai. This german lady was definitely the first undine, she has been rowing gondolas in Venezia for over 10 years, despite being twice older than Giorgia. Alexandra was often attacked by the male-only gondolier association and many restrictions were placed on her job, but she has proven she can row properly. You may wish to read this article from Italy Magazine no. 72, March 2009. Hopefully Giorgia's success means Alexandra Hai will also be able to work at will now, picking up customers with her gondola anywhere she wishes, not just the three hotels where she is currently "quarantined"! This is the Guardian's story about Giorgia Boscolo. The emergence of lady gondoliers is a complex issue, but I think it will bring a welcome change in attitude. Great news about Giorgia. It doesn't surprise me that the first women who was good enough to qualify was a Venetian. I have trained many gondoliers(in California) and more than once I have had to tell them the truth, that no amount of training will make them good enough. I don't approve of the abuse Alexandra Hai received, yet I imagine that the locals didn't admire the cheek it took for an unqualified outsider to use the courts to force her way in.